This TV audio console based on our Gibraltar Network mix engine puts more of everything -- busses, mix-minuses, channels, controls -- into a compact footprint. The D-32 sports a very compact footprint. 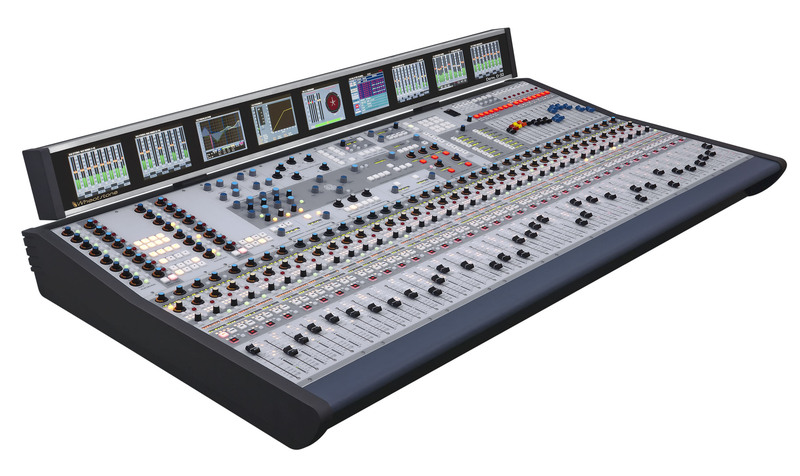 The 32-fader version, which controls 64 simultaneous sources, is only 52 inches wide. While it’s compact in size, it’s big in power. Due to the increased processing capability offered by the Gibraltar Network, Wheatstone’s powerful mix engine, the D-32 can support up to 128 input channels on paged or non-paged faders. And with Gibraltar’s 1,024 processing paths, the D-32’s eight subgroups can be configured as 5.1 stems with full EQ and dynamics processing capability. Additionally, processing can now be applied to the 16 mix minus / direct out busses and 16 AUX sends available in the D-32. The D-32 includes a “spill” function on each fader that allows selectively trimming levels within a 5.1 source. Just press the “spill” button and six signals for 5.1 are spread across six separate faders and labeled for you; the motorized faders will snap to the current levels. Make your adjustment, turn spill off, and everything switches back to normal. Audio operators love the smooth, solid controls, the vast array of mixing tools, and the unmatched versatility of the mix-minus and bus-minus systems in the D-32. And, because it’s based on the Wheatstone Gibraltar Network router, engineers love its ease of integration with automation systems from Ross, Grass Valley, and Sony. Wheatstone is synonymous with the finest audio-for-television consoles available today. The D-32 uses the battle tested Wheatstone Gibraltar router network as its audio infrastructure, providing networked I/O for AES, analog mic and line level, HD-SDI, MADI, and GPI logic in a full crosspoint routing environment. The D-32 continues Wheatstone’s tradition of building the finest audio tools for television. With an EXTENSIVE feature set in a very compact frame, you will achieve audibly superior results, whether broadcasting live or in a production environment. As with all Wheatstone products, D-32 is made right here in the USA in our New Bern, NC headquarters, and technical support is available on both coasts. Bus Minus: Direct mix-minus feed from every input fader channel with direct talkback. Outputs from all busses and bus-minus are configured within the Gibraltar Network router matrix and can be analog, and/or digital, or not fitted. Main Busses: One 5.1 Program, Three Stereo Program. This is the full-color brochure for the D-32 Television Audio Console. 10 megabytes, 32 pages, and worth every second of download time! This is the owner's manual for the D-32 Television Audio Console. WARNING - this file is large; it's over 22 megabytes in size and will take some time to download.